Australia always ranks highly on any list of the world’s best vacation destinations. Millions of people dream of visiting Australia someday, and millions actually make that dream come true each and every year. Australia is a long flight away for many people, but it’s certainly worth the trip, with its breathtaking beaches, vibrant cities, amazing attractions, and astounding natural areas offering something for everyone. It’s a truly unique place that can work perfectly well for all kinds of trip from romantic honeymoons to family getaways, backpacking adventures, and more. When you start planning your Australian adventure, you’ll need to consider a long list of factors. You’ll have to think about how you’re going to get to Australia, where you’re going to stay when you arrive, and how you plan on spending your days around the Land Down Under. You’ll also need to take spending money into account. Money is a big part of any vacation, but each country has its own currency and spending habits, and you can sometimes find that the way money works in one country might be very different to what you’re used to at home. With that in mind, let’s look at the official currency of Australia. 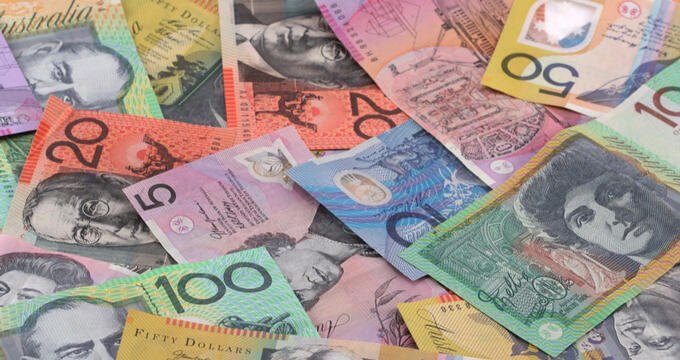 The official currency of Australia is the Australian dollar. The Australian dollar can also be referred to under the code AUD and is symbolized by the '$' sign, which is the same sign used for the United States dollar and several other currencies around the world. The Australian dollar is used in Australia and also in the following Pacific Island states: Naura, Tuvalu, and Kiribati. It is not used in some external territories of Australia like Christmas Island and Norfolk Island. A single Australian dollar is made up of 100 cents, and the AUD is one of the most traded currencies in the world. Its value changes over time, but a United States dollar is usually worth a little more than an Australian dollar. For more up to date details on the current value of the Australian dollar compared to various other currencies from around the world, you can check out the latest live currency tables and conversion rates. In the past, 1 cent and 2 cent coins also existed, but these coins were discontinued in 1991. Australian coins are all produced by the Royal Australian Mint and are formed in progressively larger sizes as their monetary value increases. The 5 cent coin, for example, has a diameter of 19.41mm, while the 50 cent coin has a diameter of 31.65mm. This progression is only true for the cent coins, however, as the $1 coin is actually smaller than the 50 cent coin but larger than the $2 coin. All Australian dollar coins featured the portrait of Queen Elizabeth II on one side and various symbols, animals, and figures on the other side like a platypus or the Australian coat of arms. Various series of notes have been issued over the years, with the latest series having started printing in 2015 and being made of a unique polymer with a special tactile feature to allow visually impaired people to distinguish the value of each note from the way it feels in their hands. The banknotes of the Australian dollar feature various figures from Australian history as well as symbols and patterns. Using a credit or debit card in Australia is very easy. Australian spending habits are very similar to those you would find in any Western nation like the United States, Canada, or the United Kingdom. Many transactions are made by card and you’ll find card readers and machines in the vast majority of stores, tourist attractions, restaurants, bars, cafes, and more. You’ll also find ATMs all around Australia, but need to be aware that charges may apply if you use your card in either a card reader or ATM in a foreign country, so it’s a good idea to call up your bank before you travel, let them know where you’re going, and find out if they’ll be charging you any hidden fees for the use of your card. No currencies aside from the Australian dollar will be permitted for use as legal tender in Australia, but you can travel into the country with US dollars or other currencies and then get them converted when you arrive. Follow these simple tips to make the most of your money in Australia. -Check out conversion rates and comparison tables online to get the best deals when converting your money into Australian dollars. Different places will have different rates and it’s always worth looking around for the best deal so you get the most spending money possible. -Buying goods and services in Australia is very easy with both cards and cash, so figure out the details on your card and learn how much you’ll be charged for each purchase. If you’re going to do a lot of shopping, it makes more sense to get a large amount of Australian dollars to spend rather than using your card over and over and paying multiple fees. -Always have at least a little cash on your person when traveling around Australia in case you encounter a place or vendor who only takes cash.